Project management tools to help you with your self build. There are a variety of project management tools available and on this page we’ll have a look at a few of them but will concentrate on the ones most useful for your self build. If you are searching for project management tools then you will have come across everything from PERTs to Critical Path Analysis. The Work Breakdown Structure (WBS). The work breakdown structure is effectively a tree structure of our task list. The WBS technique takes the whole task (Building Your House!) and subdivides it into manageable sections of work. It provides a structured way of working through the project to identify all the elements needed to pull it together. The example in the diagram shows the task divisions from breaking ground on a build to completing a watertight shell. The second and the best project management tool for self builders is the Gantt chart. This is the one we are really interested in! In the world of construction the gantt chart is the King of project management tools. The timetable for a construction project is referred to as the project ‘schedule’ or ‘programme of works’. The Gantt chart provides a simple, visual representation of the project schedule, forming the basis for many project management software programs and adorning the walls of site offices the world over. Simply, the tasks to be completed are identified and listed down the left hand column and blocks of time are shaded in the corresponding row to show the start date, finish date and the duration of each task. Additional columns can be added for budget costs, actual costs and the resources required for each task. It can be as detailed and complex as you wish to make it. 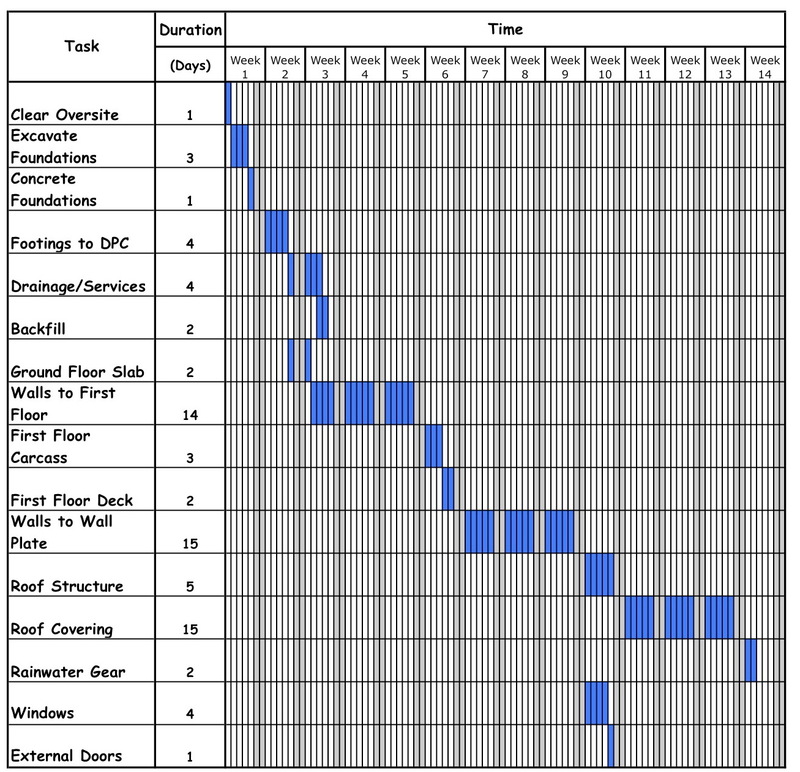 The example below shows a simple Gantt chart with a small number of tasks. These can be plotted on a piece of graph paper or a spreadsheet application. This example displays the construction phase tasks in the WBS above from breaking ground to a watertight shell. Non working days such as weekends are shaded in grey. For a project management tool like the Gantt chart to work effectively it needs to be completed as accurately as possible at the planning stage. To do this, you need to gather as much information as possible. If items are missed or an unrealistic schedule is set, the project will be destined for problems before it even gets underway. First off, identify all the tasks that need to be done to complete the build using the task list or WBS. Identify who will do each task. This can be added to your additional ‘human resources’ column. If you are familiar with house building then you may be able to enter durations for your tasks from past experience. If not, you will need to get researching again. Self build books and magazines are a good source of info and may provide case studies from projects’ similar to yours. The internet and discussion forums are also worth browsing and your architect or designer should be able to offer some advice. The most accurate estimates will be obtained from the people who are doing the work, week in, week out. Show prospective tradesmen your plans when you first meet and ask them to give you an idea of timescales along with their estimates. Back it up with your own research. Using it to Manage Your Project? An accurate program represented in this way allows you to track when tasks need to occur and organise tradesmen, equipment and materials accordingly. If as project manager you are procuring materials for your build. Be aware of special items such as beam and block floors and roof trusses which have manufacture lead times. This needs to be accounted for so that they arrive on site at the right time. Use your gantt to identify when they are required and when you need to place an order. You could even add a block to the chart as an order reminder. The gantt chart clearly displays what should be happening on your project at any point in time. Comparing what is happening on site to the chart allows you to identify progress. If the project has slipped there may be areas in the schedule that can be adjusted to pull it back later on. If not, other methods such as more people or longer hours will be needed. If you would like something a bit more sophisticated then have a look at project management software which takes the Gantt chart to the next level. Using project management tools makes project managing your self build a whole lot easier!